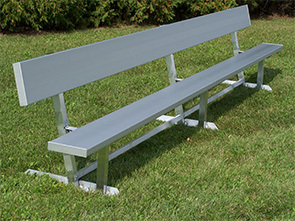 The Team Series aluminum player benches feature extra-strong 2" x 10" extruded aluminum seats and backrests with your choice of galvanized or aluminum frames on select lengths. Backrest contoured and rounded for safety and comfort. Designed for heavy-duty, commercial use and low-maintenance. Frames are available in portable surface mount or permanent in-ground styles. Aluminum welds are chemically cleaned to remove any black residue. Included galvanized hardware will not rust like zinc-plated hardware. See matching products for Team Series player benches without backrests. Extruded Aluminum Seat and Backrest. Galvanized Steel or Aluminum Frames. 6', 7-1/2', 8', 15', 21' or 24' Bench Lengths.